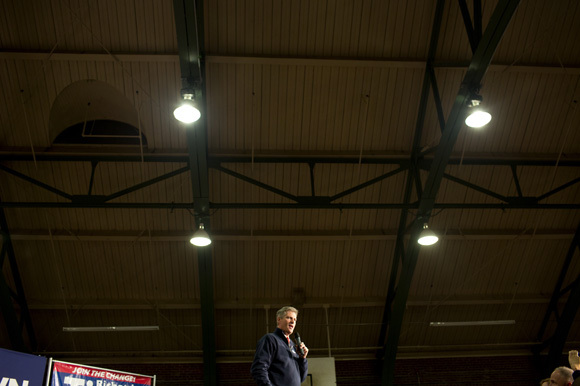 Senator Scott Brown (R-MA) waits backstage to be introduced at a rally at the American Civic Center in Wakefield, Massachusetts, USA, on Thurs., Nov. 2, 2012. Senator Scott Brown is seeking re-election to the Senate. His opponent is Elizabeth Warren, a democrat. 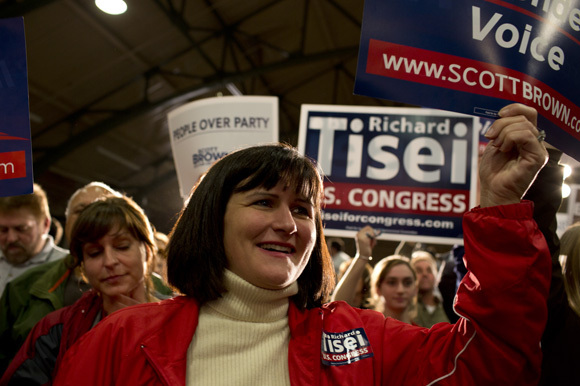 Gail Huff's aide Kristen Granchelli photographs campaign volunteers outside Senator Scott Browne's bus at a stop in Lowell, Massachusetts, USA, on Thurs., Nov. 2, 2012. 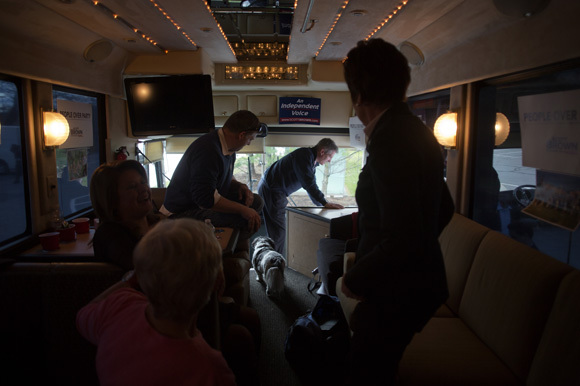 Advance director Chris Burgoyne (center), and chief of staff Vanessa Sinders (left) prepare for the next stop of the campaign bus of Senator Scott Brown (R-MA) while daughter Ayla Brown (right) works on a computer between campaign stops in North Billerica and Wakefield, Massachusetts, USA, on Thurs., Nov. 2, 2012. 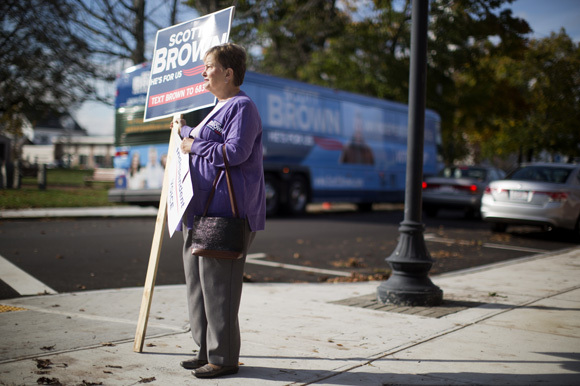 Pat Lombardi holds a Scott Brown campaign sign on a street corner in Milford, Massachusetts, USA. Lombardi has supported Senator Brown says his days in state politics. "He's somebody who's very straightforward," she said. "He's a very good man." in Milford, Massachusetts, USA, on Thurs., Nov. 2, 2012. 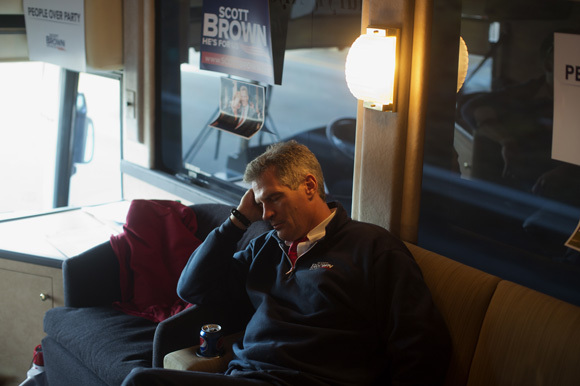 Senator Scott Brown (R-MA) rests between stops on his campaign bus between campaign stops in Framingham and Lowell, Massachusetts, USA, on Thurs., Nov. 2, 2012. 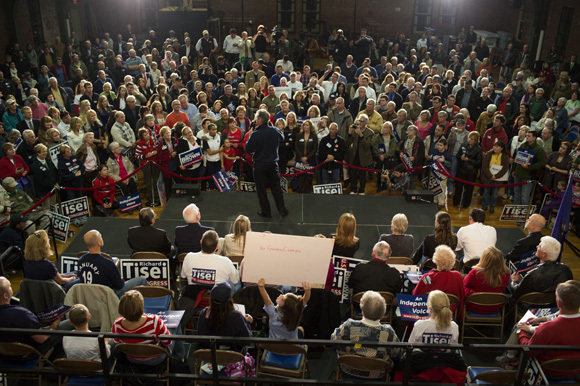 Senator Scott Brown (R-MA) speaks at a rally at the American Civic Center in Wakefield, Massachusetts, USA, on Thurs., Nov. 2, 2012. 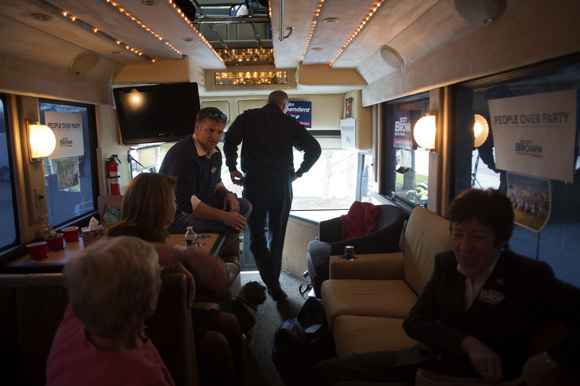 Senator Scott Brown (R-MA) leaves his campaign bus in Lowell, Massachusetts, USA, on Thurs., Nov. 2, 2012. Gail Huff, wife of Scott Brown, greets US Navy retiree and Medal of Honour recipient Thomas Kelley before Senator Scott Brown (R-MA) speaks to a crowd gathered the VFW Post 88 for a campaign stop in North Billerica, Massachusetts, USA, on Thurs., Nov. 2, 2012. 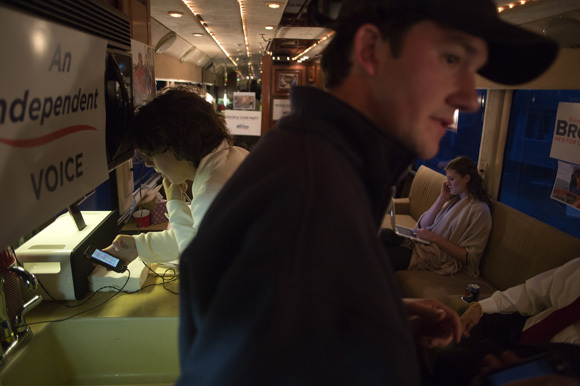 Daughters Arianna (right) and Ayla speak with their mother's aide Kristen Granchelli (left) on Senator Scott Brown's (R-MA) campaign bus between campaign stops in North Billerica and Wakefield, Massachusetts, USA, on Thurs., Nov. 2, 2012. Bumper stickers reading "Democrats for Brown / He's for us" laySenator Scott Brown (R-MA) lay on a table at a constituent lunch at Bella Costa Restaurant in Framingham, Massachusetts, USA, on Thurs., Nov. 2, 2012. 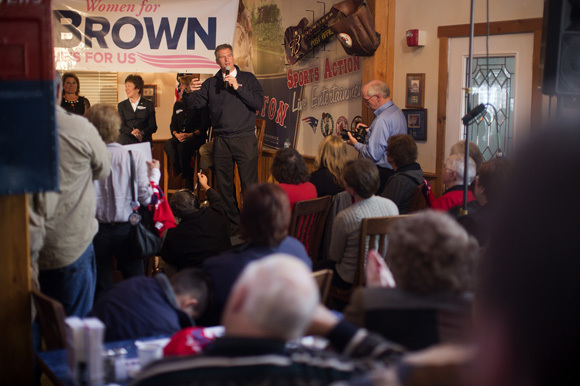 Senator Scott Brown (R-MA) speaks at a "Women For Brown" meet and greet at The Olde Post Office Pub in North Grafton, Massachusetts, USA, on Thurs., Nov. 2, 2012. 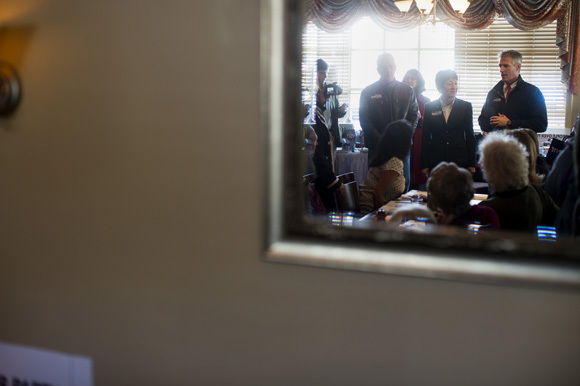 Claudia Ferrecchia, of Marlboro, listens as Senator Scott Brown (R-MA) greets supporters at a "Women For Brown" meet and greet at The Olde Post Office Pub in North Grafton, Massachusetts, USA, on Thurs., Nov. 2, 2012. 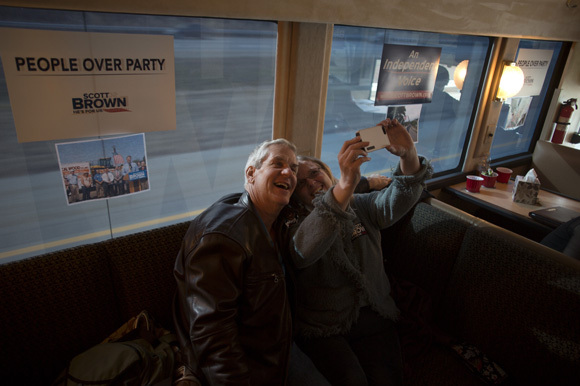 Actor Lenny Clarke (left), longtime friend and supporter of Senator Scott Brown, poses for a picture with volunteer Donya Platt, of Acton, on the Brown campaign bus between campaign stops in Framingham and Lowell, Massachusetts, USA, on Thurs., Nov. 2, 2012. People listen to Senator Scott Brown (R-MA) speak in the American Civic Center in Wakefield, Massachusetts, USA, on Thurs., Nov. 2, 2012. The campaign bus of Senator Scott Brown (R-MA) stands outside The Olde Post Office Pub in North Grafton, Massachusetts, USA, on Thurs., Nov. 2, 2012. Senator Scott Brown (R-MA) speaks at a constituent lunch at Bella Costa Restaurant in Framingham, Massachusetts, USA, on Thurs., Nov. 2, 2012. Senator Scott Brown (R-MA) waits with family and supporters backstage before being introduced at a rally at the American Civic Center in Wakefield, Massachusetts, USA, on Thurs., Nov. 2, 2012. 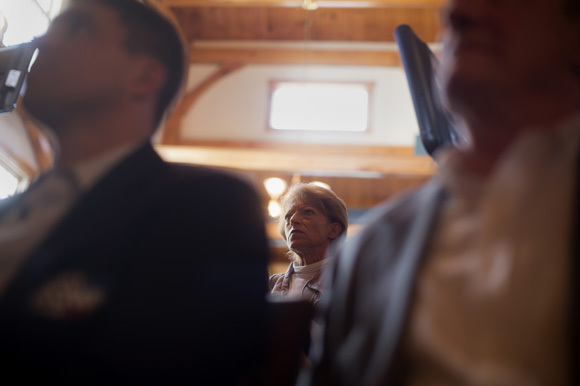 Supporter Eric Tedesco, 10, listens as Senator Scott Brown (R-MA) speaks to a crowd gathered the VFW Post 88 for a campaign stop in North Billerica, Massachusetts, USA, on Thurs., Nov. 2, 2012. 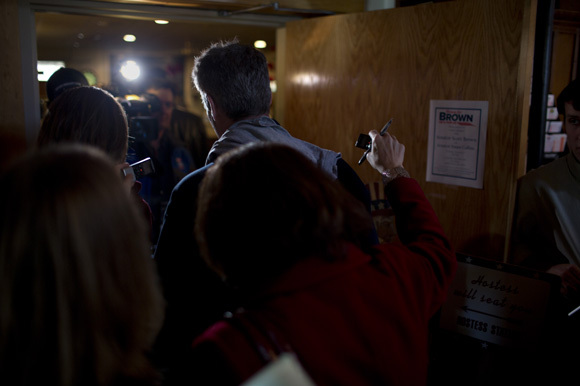 Members of the media surround Senator Scott Brown (R-MA) as he leaves a "Women For Brown" meet and greet at The Olde Post Office Pub in North Grafton, Massachusetts, USA, on Thurs., Nov. 2, 2012. Gail Huff, wife of Senator Scott Brown (R-MA) walks with Scott Brown and the press to the campaign bus in Milford, Massachusetts, USA, on Thurs., Nov. 2, 2012. 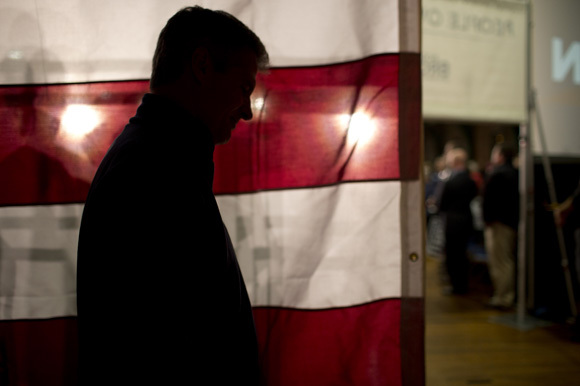 Senator Scott Brown (R-MA) waits backstage to be introduced at a rally at the American Civic Center in Wakefield, Massachusetts, USA, on Thurs., Nov. 2, 2012. I had a great assignment from the Wall Street Journal the week before US elections this year. Republican Senator Scott Brown of Massachusetts was campaigning for re-election against Democratic opponent Elizabeth Warren. I spent a day photographing the campaign, from a pancake breakfast in the morning to meetings with supporters throughout the day to riding on the bus with Brown’s family and staff between stops to an evening rally in one of the gyms in which Brown played high school basketball. Brown, who assumed office in 2010 in a special election after the death of Senator Ted Kennedy, lost the election. I couldn’t have asked for much better access, and my thanks go out Brown and his staff for allowing such an intimate look into the campaign and to my editor at the Wall Street Journal. Also, I need to give a shout out to Ian MacLellan for helping with some logistics on the day of the shoot.